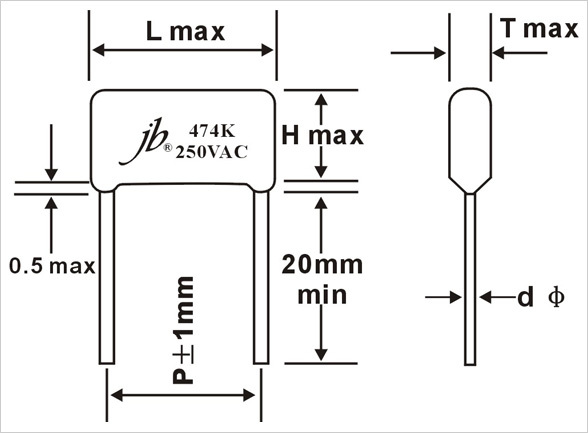 jb Capacitors manufactures and markets Metallized Polyester Film Capacitor (VAC). AC Metallized Polyester Film Capacitors have good performance with its high reliability and high stability. Following are Metallized Polyester Film Capacitor (VAC) features, specifications and drawing. We supply high quality Metallized Polyester Film Capacitor (VAC) with very competitive prices. Non-inductive, coated with epoxy resin or flame retardant epoxy power. High reliability with self-healing performance. Recommendable for high frequency circuit use. Possibility production of special specification. 175% of rated voltage for 5 sec.